Click Here To See Thunder Agents #7 Comic Book! What you are visualizing above is the original large art 1966 SPLASH page from what many consider to be the most HISTORIC story EVER drawn from TOWER COMICS! This classic 1966 SPLASH, from the story titled: "A Matter of Life and Death" features the eventual DEATH of MENTHOR at the hands of the evil WARLORDS! And to make this splash page even more incredible is the fact that is was penciled by the great STEVE DITKO just 1 month after he left Stan Lee and Marvel Comics back in 1966! This story actually hit the news stands the same exact month as AMAZING SPIDERMAN #39! This was the VERY FIRST STORY Steve Ditko penciled after drawing AMAZING SPIDER-MAN #38! And if that isn't enough to get you excited, how about WALLY WOOD inking this AMAZING BATTLE page! 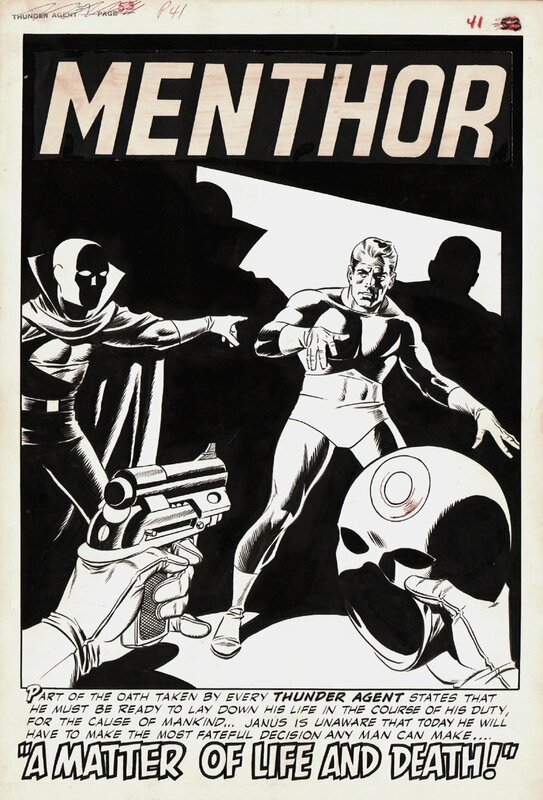 As we all know, MENTHOR looks almost IDENTICAL to Marvel's DAREDEVIL in costume, And Wally Wood drew the 5th ISSUE of Daredevil back in 1964! This is without a doubt the most historic, most detailed story that Steve Ditko and Wally Wood ever worked on together, and it is simply STUNNING! If you ever wanted a historic Large Art Superhero Silver Ages plash page by EITHER of these 2 great comic art MASTERS (especially from such a KEY "DEATH" issue) you should not pass this one up if you can help it! ALL art on our website (including this one) are able to be purchased with VERY fair time payments, and trades are always considered towards "ANY" art on our website! Just send us an email to mikeburkey@aol.com and we can try to work something out.